← American History, Family History: Am I Black Enough For You? The Emancipation Proclamation only freed slaves in the 10 confederate states, it did not free any slaves in the Border States, nor did it abolish slavery. Because of this, President Abraham Lincoln and other supporters believed that an amendment to the Constitution was needed. Thus, the 13th Amendment was passed by Congress and later ratified by the States on December 6, 1865. Which begs the question, who’s to blame for the legal enslavement of black young men — President Obama? The “Man”? Moreover, who is in a position to help break the cycle? I would say, anyone who supports efforts to hand each child a book when that child is months old and ensures someone continues to read to and with that child, at least until they start kindergarten, is working toward a sure remedy. I’d say that would be a program worth funding. Overly simplistic? Perhaps — but what are we doing, waiting for the criminal justice system (and drug possession laws) to change? Are we hoping the US prison-building boom will die of natural causes? Are we still clinging to President Lyndon Johnson’s “Great Society” dream that we can “welfare” our way out of hundreds of years of cyclical ignorance and neglect that exists in certain pockets of America, both urban and rural. 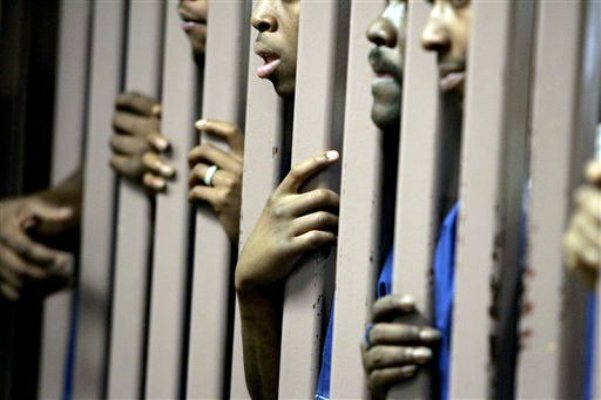 This is not just a “black” problem either, the Center on Juvenile and Criminal Justice says nearly one in four of all prisoners worldwide is incarcerated in America. If an average child can’t effectively compete in the primary publicly funded arena provided for his or her advancement in America, what is the likely outcome of that child’s life? Having worked closely with Nobel-prize-winning and other noted scientists, as a director, at the American Institute of Physics, I can assure you the answer is not of rocket science, because I would be stumped. An educable child and engaged parent, guardian or mentor, can also mitigate marginal teaching, where it might exist. A child should be reading or reading ready, before they even meet an elementary school teacher for the first time. Teachers should be held to high standards, but it’s that first teacher, the parent or guardian, who often sets the course for a child’s educational outcome. Suppose that parent or guardian is illiterate or marginally literate? Sequestration will gut the Head Start program, perhaps permanently, and we cannot afford that lapse in leadership. This entry was posted in Politics and tagged 13th Amendment, 14th Amendment, 15th Amendment, Andrew Johnson, Arne Duncan, Barack Obama, Bill of Rights, Black History Month, Booker T.Washington, Civil Rights, Civil War, Dred Scott, Drug Addictions, Emancipation Proclamation, Frederick Douglass, Great Society, Gun-Violence Task Force, Head Start, James K.Polk, John Wilkes Booth, Lincoln-Douglas Debates, Loving v Virginia, Lyndon Johnson, Martin Luther King Jr, NCLB, No Child Left Behind, Plessy v Ferguson, Race to the Top, Second Amendment, Slavery, Thurgood Marshall, W.E. B. Dubois. Bookmark the permalink. Adult literacy and early childhood education definitely serve as key determinants in the success of individuals. It also provides a clear opportunity for ordinary Americans to effect change. I think, though, that we cannot wait until the ‘war on drugs’ has run its course and need to ensure that we elect individuals who see its folly as well. I concur! Thanks for writing! I had a thought when reading your words about reading to a child starting at a few months old. I would add that the content of the words being read need to be fussed about. For example, if we are reading a story about mommy staying home and washing clothes and preparing meals while daddy goes to work to earn money we might be programming the child early on that people have certain roles, that females don’t go outside the home to work, but males do — the good being that fathers are supposed to be responsible and things need to be taken care of in the home. I don’t have an answer to this content issue but in some ways I have to think what is read to the young one might be their earliest “programming”. Here’s an anecdote worth mentioning: The first time I visited my then future wife at her apartment her grandson, four years old tops, walked into the living room and over to a computer desk. He turned on the computer by pushing a button on the computer tower and then through some effort climbed up on the desk chair. Once the computer booted he logged into a game server and proceeded to play Doom, shooting monsters and other players. He got tired of running out of ammunition and being killed so he typed in the cheat codes for “God Mode” (you can’t be killed), and “Infinite Ammo” so his guns never ran out of bullets. He happily played for a little while and when he was done he logged out of the game and shut the computer down. I couldn’t believe what I saw. This child couldn’t read yet. But he could fire up a computer, log into a server, enter cheat codes, and then back out and shut the computer down. I was simply amazed. This learning happened while sitting on his father’s lap, while the father played the game. I am sad to say now that this child just failed to graduate high school and has no ambition to finish or go on to college. He is a cashier at a grocery store. Success in school was never impressed on him, success in life was never impressed on him. But don’t dare try to best him at a complicated computer game! I don’t have answers. Quality time with parents and teachers is extremely important. But what we instill in kids, the values and activities that we teach them are fun and of value are critically important. They need to see us study, they need to see us achieve, and they need to see us enjoying life. Kids take in everything around them whether we are intentionally teaching them or not. I do admire what you are taking the time to do here. You just followed my blog and that enabled me to find you. May we both be enriched by this new bond. Very thoughtful and the roles within our culture are definitely changing. I have adult children and minor children and grandchildren– The world and its “norms’ and values are so different from what they were for my adult kids, who too are raising kids now. Thanks for reading and writing! “I would say, anyone who supports efforts to hand each child a book when that child is months old and ensures someone continues to read to and with that child, at least until they start kindergarten, is working toward a sure remedy.” Education and literacy are of extraordinary importance, people who can’t read are trapped — but I think that at least as important as the book is the human being who treasures the child enough to read to him and with him. I agree that parents (as a child’s first and most important teachers) along with educators are the ones in a position to break the cycle. Yes, it is so hard to break through– so the adult literacy movement is also important! Thanks so much for reading and writing! My niece just had her first child, and my daughter mentioned to me that she hoped her cousin would become more at ease with being a new mom as time goes by. I said to my daughter that she didn’t seem to have any problem being a confident mom right from the beginning. She replied, “That’s because I had you as a role model, Mom.” So many young people today, especially those living in poverty, do not have the role models they need to turn their lives around. I’m all for doing whatever it takes and whatever it costs to remedy that. I think you make such a great point. Parents, maybe especially young parents, often need the support of a mentors or others who fill in the gaps that may exist! I think if everyone just finds one person to help, that could make a good difference. Your daughter sounds like a wonderfully sensitive person and your niece’s nervousness and being conscious that she may need more support than her upbringing may have provided — is also encouraging. Though they are contemporaries, she probably looks up to your daughter and the lessons you taught her, may be passed on to your niece — along with daily or every other day reading time. Thanks for reading and writing! I substitute teach in a predominantly lower middle class school district. This district is fairly diverse (for being suburban/rural New York State), while still maintaining a white majority. Being involved with students K-12, I see a lot of what’s wrong with the current state of the world. Not-the-least of which is the fact that many parents of my generation seem to be unaware they’re supposed to teach their children. The number of kindergartners who enter elementary school without knowing their alphabet or colors is staggering. What’s even more disturbing is that when I do work in the elementary schools, I’m usually at the better rated elementary schools (which translates as: they have better funding, more PTA involvement, and richer parents); I can’t even imagine the percentage of children who enter kindergarten without being taught anything in the first 4 years of their lives in the schools where parents don’t have the luxury of staying home. Yours is a voice from the trenches which should be heard! True emancipation comes from decentralization of power. The cessation of federal funding of a centrally managed content programming will not stop learning, it will broaden it. As long as human nature remains corruptable, concentrated power will be a greater threat to humanity, quality of life, and justice than whatever ills are used to justify the concentration or use of such power. Strong statement! Thanks for reading writing! Very thoughtful. It’s a tough one, but I figure early learning and adult literacy outreach (which I failed to mention) are a step in the right direction, I think. Definitely agree that education, and especially literacy, as it relates to training and liberating the mind is one of the most important things we can provide out children. I do believe that knowledge and critical thinking will make all the difference I’m the years to come. literacy is a weapon. Great post. Thanks! Khalil Gibran being a favorite of yours speaks volumes about your depth of thought. I am humbled. Unfortunately it seems that society today leaves the education of children to the school system and then turns and blame that very system on which they’ve relied on when the child fails. Our Pastor touched on this a few Sundays back on how we as parents are the “teachers”. We are not to rely on society and others to set a foundation on which to build. PS Crosshairs shot was chilling! Certainly President Obama is not to blame for the failure of the”great society” . Where he must be blamed is his belief that increased welfare state helps the”poor”. The”man” is to blame for ever considering welfare as a voting tool. I must also point out that president Obama has the power to choose which programs get cuts through sequestration. He has personally chosen programs that will painfully impact the poor. Ie head start. Looking at the growth of government in the last five years one would think there are many other areas to trim. Secondly sequestration is not really a cut rather government will still spend at 09 levels. Sequestration only trims 84 billion out of 16 plus trillion dollar federal deficit. Barely a pin prick.Head start could, likely will continue to see increases in funding. That is if Obama chooses to do so. I beleive welfare is the second coming in slavery which leads to imprisonment for large numbers of black Americans. When fathers abandon their children they know big gov’ment will raise the child. Before the great society that was not even considered by anyone especially black families. They were still fighting segregation, equal rights, education. I beleive within my soul welfare is slavery and that Democrats, not republicans saw welfare as a tool to continue destroying the black communities. They have despised the 13th amendment since republicans passed it. Now and likley forever democrats hold hostage black Americans with two checks a month for food, free housing and a false impression of the business man as a fat rich Republican who wants to keep all their wealth so others starve. Blasphemy. Kill the welfare state, secure liberty for all. You put forward some very stark notions, many of which I happen to agree with. I think we have to get back to people believing they can educate themselves to freedom. Thanks for writing.